Isadora Duncan, the legendary “Mother of Modern Dance” revolutionised the dance world with her inspirational ideas on freedom of expression and scandalised society with her unconventional private life. This new play includes reimagined excerpts of some of her iconic dances and glimpses of her struggle to reconcile love and art. 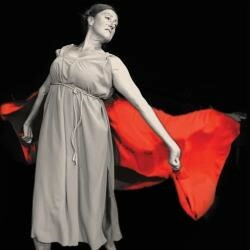 Passionate and unconventional, Isadora Duncan, the legendary “Mother of Modern Dance”, was a trailblazer and provocative free thinker who opened the door to a new, expressive world of dance and her creative legacy continues to this day. Described by the artist Rodin as “the greatest woman I’ve ever known”, she was one of the first international superstars, her dancing enthralled audiences, yet her reputation was destroyed by the press, her private life scandalised society and she died in poverty as result of a tragic accident. This new play, written, choreographed and performed by Elizabeth Blake, celebrates her inspirational ideas on dance and includes reimagined excerpts of some of her iconic dances and glimpses of her struggle to reconcile love and art.